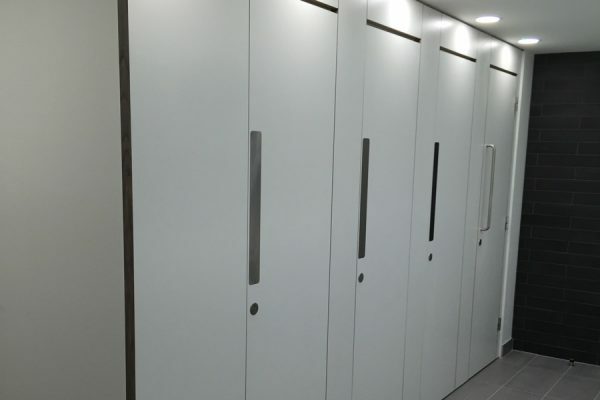 We’ve installed new male and female washroom facilities on all three levels of an office building situated on a popular business complex between Reading and London, as part of a major refurbishment project. Building 220 has been completely refurbished by Collins Construction as part of a wider regeneration scheme at the Winnersh Triangle, an 85-acre business complex which is home to more than 50 businesses. Not only has the project refreshed the building’s interior, bringing it up to Grade A standard office accommodation, but with a new glazed entrance structure, the floorplate has been extended out over the main entrance under a new roof membrane. We worked closely with Collins Construction to install new male and female washroom facilities on all three levels of the building as part of the refurbishment. A stylish monochrome colour scheme was used throughout to create a contemporary washroom space with a sleek, minimalist feel. The new washrooms feature our full height Alto toilet cubicles. With its flush front design, the Alto toilet cubicle creates a virtually seamless façade while the full height provides complete privacy for users. Alto toilet cubicles can be tailored with the option to specify a huge array of different finishes and colours. 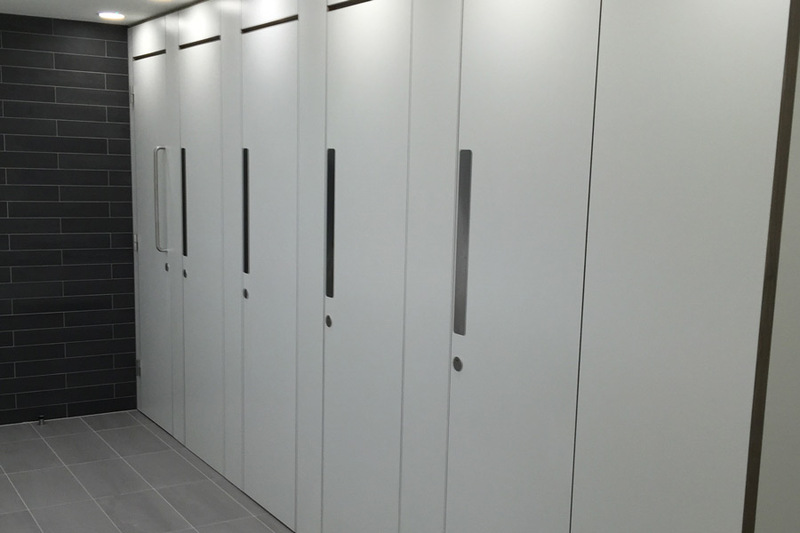 On this project the cubicle doors were faced with plain white laminate and finished with stainless steel DDA compliant pushplates and locks. 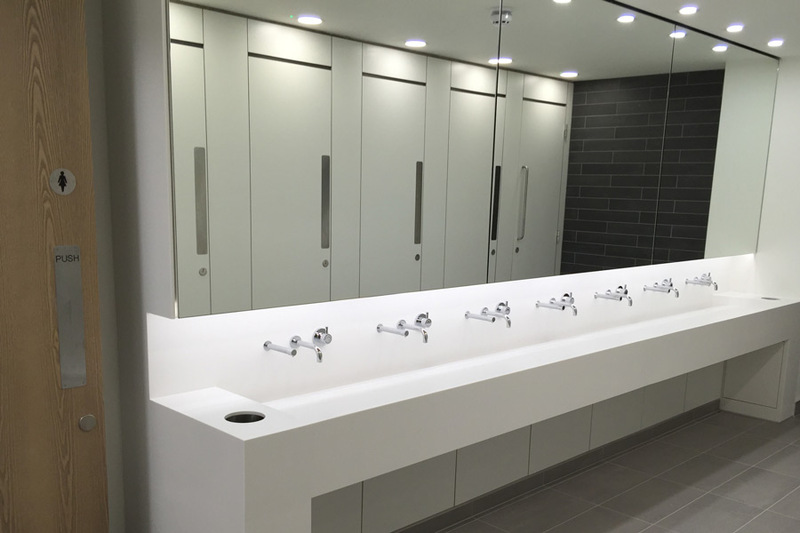 The team also installed bespoke white Corian trough-style vanity units, designed with a gentle slope to drain water away to keep the washrooms clean and tidy. 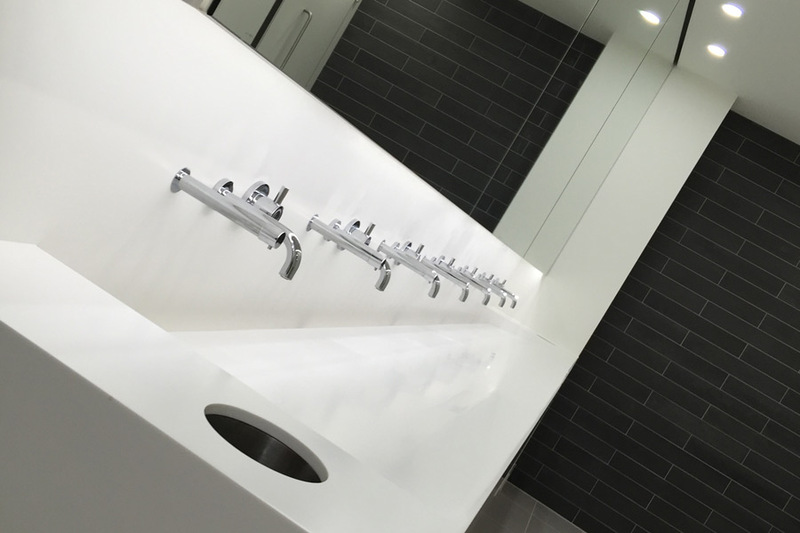 The soap dispensers and taps were wall mounted and the waste bins were inset into the bespoke vanity units to retain clean lines and match the minimalistic design achieved. Corian is an increasingly popular choice for commercial office washrooms and for vanity units in particular due to the fact that it’s easy to clean and durable enough to withstand the rigours of a high traffic environment. The fact that it’s available in a wide range of colours and textures and can be cut to almost any shape means that it also offers virtually limitless possibilities for creating bespoke washroom areas. Completing the design, our Concerto integrated laminate duct panel system and laminate urinal ducts with toughened glass divisions were installed in a crisp white colour.